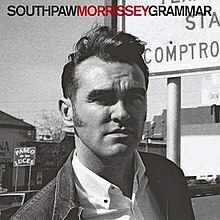 Southpaw Grammar is the fifth studio album by English alternative rock singer Morrissey, released on 28 August 1995 by record labels RCA in the UK and Reprise in the US. The album charted at number 4 in the UK and number 66 in the US, but received a mixed response from critics. The singles lifted from the album were "Dagenham Dave" (which reached number 26 in the UK Singles Chart in August 1995) and "The Boy Racer" (which reached number 36 in December). The nature of the album is different from past Morrissey releases, such as the inclusion of two tracks which surpass the ten-minute mark, the near two-and-a-half-minute drum solo courtesy of Spencer Cobrin which opens the track "The Operation" and the sampling of a Shostakovich1 symphony. AllMusic described it as Morrissey's "art rock album, complete with strings, drum solos and two ten-minute songs." According to Morrissey himself, the title refers to "the school of hard knocks"; that is, boxing (a southpaw being slang for a boxing left-hander and grammar a reference to British grammar schools). Another reference to boxing is the original cover photo, a photo of boxer Kenny Lane taken from the April 1963 issue of boxing magazine The Ring. Spin magazine described the album's musical style as "[differing] from the crushed flowers studio formalisations of last year's Vauxhall and I, building instead on the earlier Your Arsenal, Morrissey's sly, unexpected blending of rockabilly and glam." And recorded in the mid-90's, it's an album clearly influenced by Grunge Music. Southpaw Grammar was released on 28 August 1995 by record labels RCA in the UK and Reprise in the US. The album charted at number 4 in the UK and number 66 in the US. On its release Southpaw Grammar was an eyebrow-raiser for fans and critics alike. The singles released from the album were "Dagenham Dave", which reached number 26 in the UK Singles Chart in August 1995, and "The Boy Racer", which reached number 36 in the UK Singles Chart in October. On 27 April 2009 Sony BMG released a remastered version of Southpaw Grammar in the UK. This version included a substantially altered running order, three previously unreleased tracks, "Honey, You Know Where to Find Me", "You Should Have Been Nice to Me" and "Fantastic Bird" (the last of which dates from the Your Arsenal sessions) as well as a single B-side "Nobody Loves Us" and new artwork by Anthony Lui, including previously unseen photographs by Linder Sterling, closer to Morrissey's vision. The digital version from iTunes Store adds live versions of "London" and "Billy Budd", recorded in London. The critical reception to Southpaw Grammar was mixed. Richard Cromelin of the Los Angeles Times described it as "the most musically dynamic album from the Messiah of Moans since he revitalized British rock with The Smiths in the mid-'80s". Al Weisel of Rolling Stone qualified it as Morrissey's "most powerful solo outing to date". Q's Phil Sutcliffe wrote that Southpaw Grammar "shapes up as the kind of severe work that accrues more honour than love, more favourable comments than sales to record-buyers", and the magazine later listed it as one of the top 50 albums of 1995. In 1999, critic Ned Raggett ranked the album at number 79 on his list of "The Top 136 or So Albums of the Nineties". According to Uncut magazine: "On its release, Southpaw Grammar seemed to be the point where the Great British Public officially fell out of love with Morrissey. The casual Smiths fan had all but lost interest while even the scary Moz obsessives were a little puzzled." Blender's Tony Power called it an "ugly, noisy, grumpy album, recorded while Britpop stole Moz's thunder and the Mike Joyce court case loomed." Andrzej Lukowski of Drowned in Sound was more favourable in his retrospective assessment, writing that the album "is in some ways the most daring thing the ex-Smith has ever put his name to... [...] At the same time it's also pretty craven, in that it dilutes the impact of its three key tracks – 'The Teachers Are Afraid of the Pupils', 'The Operation' and 'Southpaw', dark, sprawling semi-instrumentals dominated by the remarkable drumming of Spencer James Cobrin – with lightweight fluff like 'Dagenham Dave' and 'The Boy Racer'." Brad Shoup of Stereogum named it Morrissey's "peak" and "quintessential document". Note: Given the 2009 re-release CD is a mock up of a vinyl record, the words "the heart is a lonely hunter" appear on the runout grooves. ^ a b c Erlewine, Stephen Thomas. "Southpaw Grammar – Morrissey". AllMusic. Retrieved 5 December 2014. ^ a b Hunter, James (November 1995). "Morrissey: Southpaw Grammar". Spin. 11 (8): 122–24. Retrieved 5 December 2014. ^ a b "Morrissey – Southpaw Grammar/ Maladjusted". Uncut. 27 April 2009. Retrieved 4 December 2014. ^ "Years of Refusal: New Album Information; Southpaw Grammar: Remastered Version Details; Ireland Festival and Concert Dates | True to You". True to You. 30 May 2008. Retrieved 5 December 2014. ^ a b Power, Tony (15 September 2004). "Morrissey: Southpaw Grammar". Blender. Archived from the original on 28 November 2005. Retrieved 18 November 2015. ^ Webber, Brad (7 December 1995). "Morrissey: Southpaw Grammar (Reprise)". Chicago Tribune. Retrieved 5 December 2014. ^ Romero, Michele (15 September 1995). "Southpaw Grammar". Entertainment Weekly. Retrieved 20 June 2016. ^ a b Cromelin, Richard (16 September 1995). "Morrissey's Essence Remains the Same". Los Angeles Times. Retrieved 5 December 2014. ^ a b Sutcliffe, Phil (September 1995). "Morrissey: Southpaw Grammar". Q (108): 120. ^ a b Weisel, Al (5 October 1995). "Southpaw Grammar". Rolling Stone. Retrieved 5 December 2014. ^ Sheffield, Rob (2004). "Morrissey". In Brackett, Nathan; Hoard, Christian (eds.). The New Rolling Stone Album Guide (4th ed.). Simon & Schuster. pp. 561–62. ISBN 0-7432-0169-8. ^ Morris, Mark (September 1995). "Knuckle dusted". Select (63). ^ "50 Best Albums of 1995". Q (113): 66. February 1996. ^ Raggett, Ned. "The Top 136 Or So Albums Of The Nineties". Freaky Trigger. Archived from the original on 20 January 2000. Retrieved 28 September 2011. ^ Lukowski, Andrzej (29 April 2009). "Morrissey: Southpaw Grammar and Maladjusted (Expanded Editions)". Drowned in Sound. Retrieved 5 December 2014. ^ Shoup, Brad (10 December 2013). "Morrissey Albums from Worst to Best: Southpaw Grammar (1995)". Stereogum. Retrieved 5 December 2014. ^ "British album certifications – Morrissey – Southpaw Grammar". British Phonographic Industry. Select albums in the Format field. Select Silver in the Certification field. Type Southpaw Grammar in the "Search BPI Awards" field and then press Enter. "Redondo Beach" / "There Is a Light That Never Goes Out"
This page was last edited on 13 April 2019, at 23:27 (UTC).